I believe it was Leonardo Da Vinci who once said “The soul is composed of music”. If our souls long for expression, and a child’s whole sense of being is suddenly altered by Autism, could that explain why so many people with Autism excel at music? One such person is Nicholas Krishnan. Nicholas talked at a very early age. His mother described him as “a sweet, bright, adorable little boy”. But shortly before his 2nd birthday Nicholas lost his ability to speak and make eye contact with others. At that time, his family felt like they had lost the little boy they had come to know. They were determined to channel their energies toward rediscovering him in new, challenging, and rewarding ways! Though much about Nicholas changed seemingly without a moment’s notice, it was apparent that one thing remained in tact. Nicholas loved music. And though autism stole his ability to communicate with language, he retained the ability to sing. His parents, Shari and Rajan Krishnan of Michigan reported that music created a way for them to get a glimpse into what Nicholas was thinking. Nicholas has a rare ability to identify any pitch heard and can produce any pitch when referred to by name. This is called absolute pitch. This gift helped to open doors for him to be involved in music education programs throughout his entire PreK-12 experience. Beginning in the 5th grade he was involved in school band and choral programs. 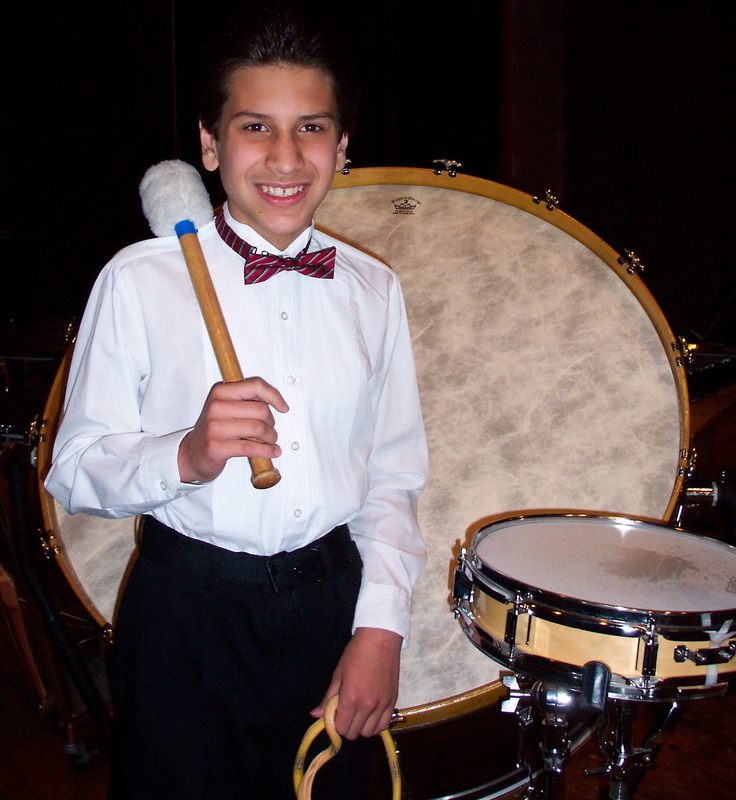 Through these experiences, and his progressive hands-on engagement while rehearsing, Nicholas’ distractibility and escape-and-avoidance behaviors (Nicholas’ autism-related behaviors) gradually decreased in severity and frequency, allowing him to perform at all his band and choir concerts. What would you do if your ability to communicate was suddenly taken away from you? Suddenly you are forced to exist in a world with which you may have the outward appearance of having lost connection; yet inside, it may be the furthest thing from the truth. Nicholas has difficulty communicating his needs. However, music communities tend to bring people together who respect Nicholas, as a musician and peer, so they are always willing to help. Autism Spectrum Disorder is a range of complex neurodevelopment disorders, characterized by social impairments, communication difficulties, and restricted, repetitive, and stereotyped patterns of behavior. There are many schools of thought as to what may cause or trigger the onset of Autism, but most everyone affected by it agrees that much remains to be discovered and understood. If a family struggles to stay connected to their dearly loved child with autism, you can imagine how much difficulty is experienced in trying to address the challenges of autism in our educational system, our communities, and the world of business. Autism sometimes makes villains of well-intentioned people who may not possess the education to understand or the resources to approach these challenges with flexibility. Yet Nick’s story is full of heroes who have gone the extra mile for him. There were administrators, special educators, general educators, music teachers, camp directors and staff, music therapists, drum circle facilitators, musicians, friends, one on one helpers and para educators, speech therapists, community leaders and organizers, and many others who provided opportunities for Nicholas to experience a full and enriching life and shape him into the wonderful young man he has become. Today, the tenacity of Nick’s parents and the team of professionals who have assembled around him throughout the years has paid dividends. Nicholas completed his high school studies in June of 2010 and has his own apartment. During high school he was a member of the swim team, track team, band, and choir. He has already completed online coursework with the Berklee College of Music and is studying video editing, providing him with one more way to communicate. He has many supportive and loving friends. I believe Da Vinci’s quote is validated by Nicholas and countless others in our world who experience inspiration, depth and meaning through the power of music. Amidst the warmth of this nurturing environment Nicholas is truly a soul composed of music. 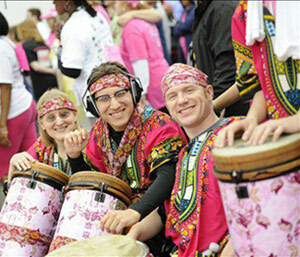 He has seized the opportunity to give back to his community and joined the Ford Warriors in Pink drummers at the Susan G. Komen Race for the Cure® in Detroit for the last few years. It is such an inspiration to see someone who personally faces profound life challenges with autism, reach out in a selfless way in support of people with breast cancer. 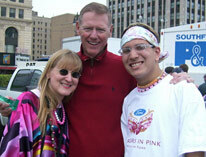 During a radio interview the Ford Warriors in Pink team named Nicholas an “Honorary Warrior in Pink” in recognition of his support. Nicholas responded by presenting them with a recording of him drumming the website’s musical intro at fordcares.com . If you’d like to hear more about Nicholas’ story download the Music4Life Radio Show archive at: Music4Life.